Starkfire is our House Brand of stoves; hand-picked by Wrex himself to compete in the market by opening the door for a more cost effective yet quality European stove. This range bridges the gap between inferior stoves and top end stoves through better bulk buying and favourable country based pricing. The Starkfire brand will always be made up of known European manufacturer’s products widely distributed by various branding outfits throughout Europe. The Starkfire Signum 35 is a large brilliant design incorporating all that has been learned about closed combustion fireplaces over the decades. This unit has primary, secondary and tertiary air inlets as well as a clever mechanical thermostat which will self-regulate the incoming air to the combustion chamber. The Signum 35 is a Large, oval, modern and clever but still very easily serviceable and we like it. Click here to read more about Starkfire Signum 35. 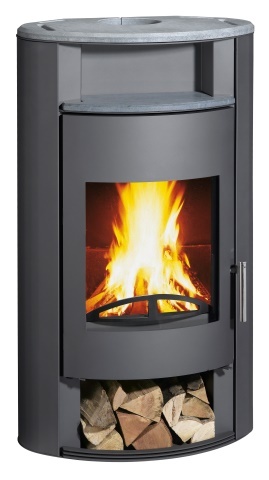 The Starkfire Signum 15 with its curved door and the high rounded glass as well as air wash glass cleaning system allows enjoyment of the flames from almost all angles. The elegant ceramic cladding ensures optimum heat storage and sets design accents. The spacious combustion chamber with heat-resistant vermiculite, integrated ash pan and shaker grate, as well as the large wood storage compartment provides plenty of practicality. Ceramic colours available in black, white and red. Click here to read more about Starkfire Signum 15. Due to load shedding and the public holiday we will be closed on Thursday 21st and will reopen on Monday the 25th of March.